I’ll never look at my garden the same way again. Only a few pages into Sue Reed’s Energy-Wise Landscape Design: A New Approach for your Home and Garden (New Society Press, 2010) I started glancing around my yard with a new eye. How well did our trees funnel summer breezes and block winter ones? Were deciduous trees and conifers planted in the optimal places? Well, I already knew the answer to that one: no. I’ve got five large spruce grouped on the east and south-east side of the house, and while they do a marvelous job of keeping us cool during heat waves (like the one last week), they do an equally good job of blocking winter sunlight and preventing passive solar warming of the house. And by large, I mean fifty or sixty feet tall–much, much taller than our two-story house. You can see the relative size in the photo above. 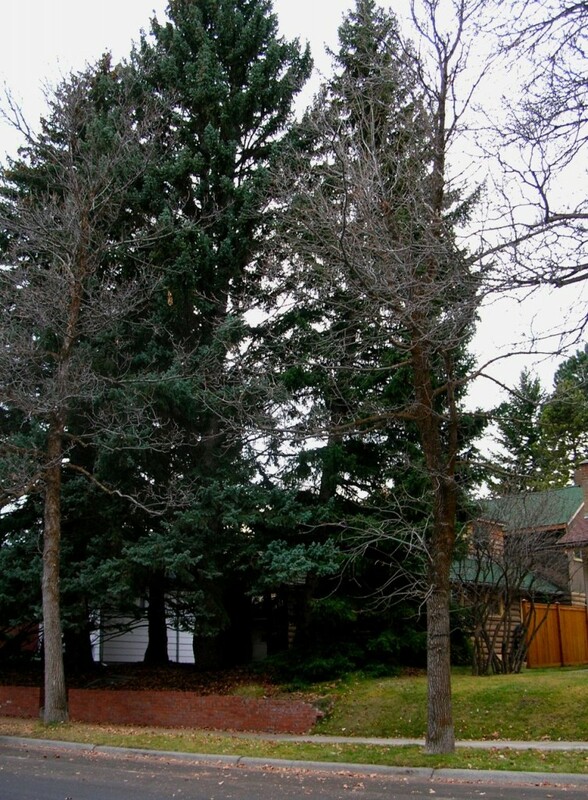 This is the east side of our house –or it would be if you could see it behind the spruce. Note the other evergreens in the background. We’re surrounded! So I have long wished that the pine beetles (which do take out the occasional spruce) would adopt one or two of the five (preferably those on the south-east corner of the property) thus relieving me of both the guilt and responsibility that would assail me should I ever screw up the courage to remove them myself. Anyway, I was staring at this tree, which sits squarely in the rather narrow side yard, effectively filling it. It’s a gorgeous thing to look at from the patio, especially around sunset, much prettier than the more scraggly ones we’d see if it were removed, and far prettier than the street would be if we removed both it and the one beyond. But I also realized, quite suddenly and entirely thanks to Sue, that it serves an important function in blocking winds. While our prevailing winds follow the continental lead and come from the west, some of our strongest storm winds are easterly. And that tree—along with its fellows—effectively blocks them. If it and the other east of it were removed, we’d create a channel between our house and the one next door, and winds would just rip through there. Not just east winds; west ones too. Which would make the patio a much breezier place—too breezy, much of the time. As it is, we can use our protected patio quite early in the spring, and when it grows too hot, we just shift to the dense shade of the back yard. Sure, we could plant deciduous trees there, and this is high on my wish list: trees on the south-east that would drop their leaves come autumn, letting winter sun reach the house. But how long would it be before replacement trees trees grew to a height that let them block winds or shade houses? And how uncomfortable would our patio and house be in the meantime? One thing’s for sure: taking out both trees on the SW would be a major mistake. If we do decide to remove them, we should do it one at a time, so that a replacement could have a chance to grow and bulk up a bit before we asked it to take on the wind-blocking function so aptly performed by those mighty spruce. 14 Responses to Too Many Spruce–? Great article. I love Spruce Trees. My property is full of them. 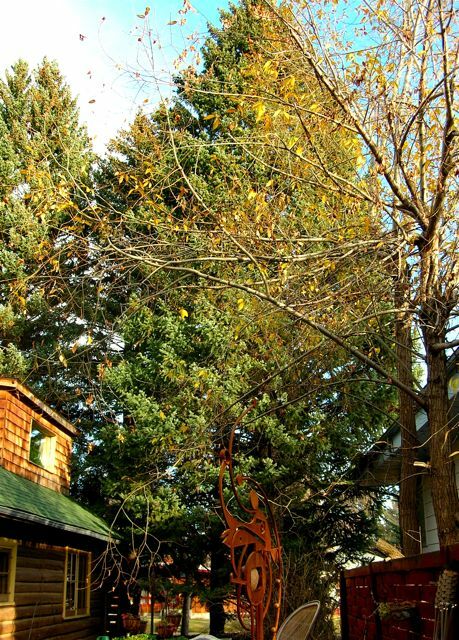 Very informative I loved the article spruce trees add more then just beauty to the home! I’m not a big Spruce fan (way too prickly) but if you substitute in Doug Firs or Hemlocks, I completely understand. One of the hardest things we did when we moved into our house was cut all the overgrown cedars and shrubs down. It was necessary, even if it meant the weeds moved right in, but we still haven’t had the time or money to fill in all the vacated space with things that we really want. We also have a love hate relation with some trees only ours are 60 foot pines. Our view has been slowly diminishing over the years so last fall we took out a few selected trees. Big decision though as the pine beetle is going through pretty good here and they are not as selective as we are. Las thing we need to do is end up with no trees in the front which would open us up to the road. You are best to go slow. Send flowers to India, through India’s leading online florist FnG STORE INDIA (http://FnGstore.com). We offer same day delivery of flowers, express hand delivery of flowers to India, midnight flower and cake delivery service with assured delivery. For order query or assistance email – sales@FnGstore.com or call +91 9999 890 555. It’s such a dilemma – sun or shelter. Maybe take one out and replace with a deciduous tree like you suggested, and then meanwhile line the windy side of your patio with tall, evergreen potted shrubs to try and dissipate the wind a little? Very tough choice…and good food for thought when looking at the landscape around the house. What do you recommend for sprucing shrubs? I don’t have any big trees like that around my house or on my website. Although if you are interested in butterflies and bushes you can visit my website to learn more. Thanks for sharing. My name is denny hemlin and I am Specializes in organic gardening. On 22-1 on Wednesday I want to give your site visitors 5 books on organic gardening for free download. I would appreciate it if you could post it on your site. This is my 5 books.all of them will be free on 22-1 on Wednesday. I don’t believe you’re actually contemplating removing those trees. They’re amazing! I think that would be a huge mistake. I would never be able to do that! Why don’t you just trim the trees to let the sun in?